With views of three major Hollywood landmarks (the Hollywood sign, Griffith Observatory, and Bronson Cave), this trail is basically a slightly sweatier version of the Starline bus tour. Griffith Park is famed for its views of the Hollywood Sign, but take the path to Bronson Canyon to check out the tunnel entrance of the ’60s era Batcave. The cave was even the home of a pop-up ice cream parlor last weekend. The canyon also delivers a stunning view of the Griffith Observatory, which appeared in the classic James Dean film Rebel Without A Cause. The three-mile loop is tame, but don’t underestimate the 1,821 foot elevation—bring water. Be sure to visit the Wisdom Tree at the top, rumored to have been the sole survivor of a wildfire in 2007. The tree is so photogenic; it even has its own Instagram account. Hikers looking to extend the trail can continue on to the Hollywood Sign at the peak, and the less zealous have an easy, downhill return. The standing water that gives the trail this name might be low, but the surrounding geography is as gorgeous as ever: towering boulders, shady nooks, and a few friendly frogs. The hike isn’t dauntingly difficult, but visitors should expect to get a bit dirty and sweaty scrambling over rocks inside the grotto. The lopsided climb makes descending a breeze, but the return trip is mostly uphill. Pro tip: Park at the nearby Circle X Ranch campground. The dog-friendly trail is popular with locals for its free parking and moderate incline, making it the perfect addition to your weekend hike rotation. When you reach a fork in the trail, go right for a quick hike or left for the more challenging (and scenic) route. In addition to local fauna, the trail is also home to a few Pokémon and doubles as a Pokéstop. In other words, it’s the perfect place to hatch a few eggs and expand your Pokédex. Most scenic L.A. hikes provide views of the ocean or Griffith Observatory, but these trails provide a stunning view of downtown. The area is the regular home of regional cross-country races, giving it good workout cred. Additionally, the park itself is well stocked with attractions like picnic areas, running paths, and a Japanese garden. Easily accessible rock pools make Malibu Creek one of L.A.’s best loved hikes, and for good reason. New hikers just need to follow the stream and the happy shouts of jumping hikers—diving is technically forbidden but still common. The trail continues on to Century Lake, the setting of a couple scenes from the 1968 Planet of the Apes film, for a pleasant 5.7 mile loop. Big Tujunga Creek is a major tributary of the L.A. River, streaming through the steep canyon walls of the San Gabriel Mountains to reach the Pacific Ocean. The connecting falls, nestled in the Angeles National Forest, are one of L.A.’s best kept secrets. A fire road is quickly transformed into a tree-shaded mountain pass that becomes quite steep and narrow as the falls approach. Keep an eye out for snakes, as they are occasionally spotted on the trail. The rain has transformed the Angeles National Forest, making the foliage flourish and water stream down the fifty-foot falls. Keep your feet dry by using logs to cross the small creeks that stud the dog-friendly trail, and be sure to wear sensible shoes to avoid slipping. Start at the Switzer Falls Picnic Area in Colby Canyon, then head down the Gabrielino Trail about two miles to reach the waterfall. A $5 Adventure Pass is required for parking. Nestled inside Griffith Park, this tree-lined trail is ideal for adventurers of all ages. The recent rainfall has made the area’s plentiful vegetation impossibly lush, giving a fairy tale quality to the wooden footbridges and tiny waterfalls that line the path. Traversing the trail doesn’t take long, but the plentiful park benches, giant ferns, and koi ponds make lingering a pleasure. Consider it the perfect urban oasis. A 2.5 mile loop winds past a teepee and small cave to reach the forty-foot waterfall that gives Paradise Falls its name. The water quality is too poor for swimming, but the falls feed into a rock grotto that acts as an excellent spot to sit and take in the view. Extend your hike by continuing on to nearby Lizard Rock, where a fairly steep incline results in impressive views of Wildwood Regional Park. The seven-mile loop takes hikers up the Backbone Trail past fields of wildflowers to the top of Sandstone peak. It’s gorgeous but strenuous, so don’t underestimate the climb. Nestled high in the Santa Monica Mountains, the summit holds a registry where successful hikers leave their names and (sometimes) witty trail commentary. 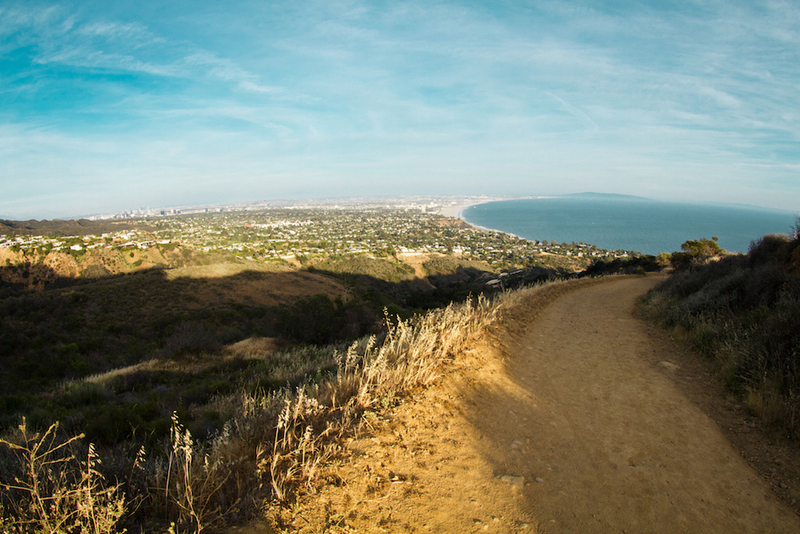 Make it to the top of Temescal Canyon’s winding trails and your prize is a panoramic view of Los Angeles. On a clear day, the hike up to Skull Rock will reward you with vistas of the ocean and the westside. The almost-ten mile trail follows the San Gabriel River through spiky yucca plants and hot, rocky mountains to reach the giant Bridge to Nowhere—a failed government project turned bungee jumping destination. The hike can be punishing, so start early to avoid a wave of afternoon heat. No need to leave your pup at home on a trip to Debs, where manageable inclines and shady spots make for an especially canine friendly jaunt. The on-site pond is ideal for a game of water-logged fetch. At 3,111 feet, Sandstone Peak is the tallest point in the Santa Monica Mountains. The summit can be reached via a 6.25-mile loop with 1,075 feet of elevation gain that offers expansive views of the range. Forty minutes from Santa Monica, you will feel like you are embarking on a true adventure. Dogs are welcome in the Griffith Park and West Trail Loop. There is a quaint picnic area at the base where you can relax with friends and have lunch before taking off on the path to the top, where you’ll enjoy views of the city and observatory. If there was a ‘see and be seen’ place for dogs, this would be it. Whether it’s early in the morning or the sun is setting, there is never a shortage of dogs walking, running or hanging out with their owners. There are also meet-up groups and social gatherings where dogs can get together and play. Quintessential Southern California, this path will take you from Santa Monica through the oddities of Venice Beach all the way to Marina Del Rey. The only caveat: At the start of the path in Santa Monica, you will be sharing road with bikers, roller bladers, walkers, and runners. This unknown trail offers runners and walkers a little serenity from the city only a short drive away. Right off Lincoln Boulevard, this dirt trail provides views of Playa Vista and the ocean. Since it’s never crowded, dogs are mostly found off-leash running the trail with their owners. You can hop on and off this trail anywhere along the coast of California. As south as San Diego, and as north as Del Norte, you can see great ocean views throughout the state. If you’re just planning on a day-hike in L.A., the best places to pick the trail up are in Malibu and Santa Monica. Throughout a three mile radius in Pacoima City, you can see over 50 murals done by local artists. Take a stroll and and admire the art that now defines the area. The Arroyo is an 11 mile hike starting in the San Gabriel mountains. To do the whole thing, you better be up to the challenge of steep heights. But if you just want a casual day-hike, go straight to the Rose Bowl loop in the middle of the trail. This 3.1 mile section is perfect for walking the dog, and taking a simple stroll. Also known as Elysian Valley, Frogtown is home to a quaint trail used mainly by those in the neighborhood. The hike offers heights and great views of the Valley and downtown, and is still an easy trip. Leached dogs are welcome on this 4.2 mile hike, as are mountain bikers and equestrians. Take a 3.5 mile trek from Redondo beach to Manhattan beach. Walking, jogging and biking welcome. The trail is also handicap accessible. If you’re looking for a hike up north, this San Fran trail will provide views and a bit of history. This trail through the Santa Monica mountains is long, but you can stop at any point to pick it up for a day. Dogs on leashes welcome. Families and kids will enjoy the 1.2 mile trail along a sandstone rock outcropping. Make sure to check out the hummingbird trail. This trail is for serious hikers. Trek the 8.9 mile trail and enjoy the scenery of beautiful wild flowers from March – October. Dogs allowed. Hike near the coast at Charmlee Wilderness Park, a 590-acre reserve overlooking the pacific. This 8 mile trail is sure to have something for hikers of all levels. Centered between Beverly Hills and the San Fernando Valley this trail-seeker wonderland offers beauty and accessibility. Visitors can check out the duck pond which is wheelchair accessible. Located off the 118 fwy check out this rock climbers paradise. Massive boulders come together to form caves and grooves that will keep you exploring for hours. Hike near coastal bluffs at this family-friendly trail. Don’t worry about elevation change, this beginner level trail only descends 40 feet from the main trail to the coast. This trail is perfect for hiking, walking and trail running. Considered a moderate trail, make sure to make it to the waterfall. Dogs allowed. This gem of a trail is perfect for couples. Cross the 3.3 mile trail and enjoy a drink from one of the local shops along the boardwalk. Located on a 1,000-acre reserve, Sara Wan offers several options including picnic areas, hiking trails and an educational center. If the appeal of an ocean-side hike isn’t enough to get you going, what if we said you can bring your pup, too? Zuma Canyon Ocean View Trail offers a single track trail and steep inclines. Make sure to stretch before tackling this beast. Love wild flowers? Then this trail is for you. Designated as easy-peasy this 1.4 mile trail is all about enjoying the scenery. This moderate trail offers 5 miles of scenic glory. Tucked in the quiet city of Pacific Palisades trek this trail with your special someone. Or alone. Alone is fine. Coming in at a whopping 1,255 acres of preserved land, Tuna Canyon Trails is relatively unknown to most hikers. The main trailhead is 1.6 miles and branches off into several trails varying in difficulty. Tuna Canyon Park has something for trail-seekers of all levels. Griffith Park’s Horse Stables Are Closing, but You Can Still Saddle Up in L.A.